Once a thorough and proper diagnosis has been made, the best appliance to be used to correct your child's problems will be selected. A functional appliance is a tiny device designed like a mouth retainer, with micro-screws or springs, to make the appliance able to activate and stimulate the change in bone, therefore making the jaw grow to its potential. The initial records and x-rays, taken at the beginning of treatment, determine growth potential. Once the early phase of treatment is finished your child will be evaluated on an ongoing basis to monitor the eruption of the permanent teeth. Once the permanent teeth are all present. We will set up a consultation appointment to determine whether there is a need for braces. Usually orthodontics, which means fixed braces, does not begin until the patient has all their permanent teeth (age 11 to 13). While braces are the most popular among younger patients, they can be worn as a teenager or an adult. 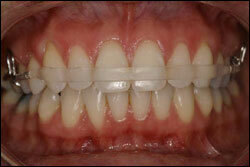 More adults these days are asking for braces to help improve their smile and appearance. Set up a free initial screening appointment for your child today or yourself today? Most patients today think braces are "cool" because of all the different colors. In fact, there are more that 40 different combinations of colored elastics, which fit over the braces to keep the wires in place. Every month the patient has their choice of colored elastics. Most children pick the metal braces, which are much smaller today. Adults and teenagers prefer the clear braces because they blend in with the color of the teeth and are harder to see. The newest and latest trend is toward invisible braces, where trays that are changed periodically and move the teeth into a better position. For more information on clear braces, click here.